A new Texas museum opens today (Feb. 1) to honor the space shuttle Columbia and its seven-astronaut crew on the eighth anniversary of the fatal disaster that ended the orbiter's final mission. The Patricia Huffman Smith Museum in Hemphill, Texas, seeks to present the history of space exploration, along with space-related artifacts, a digital learning center and informational items about NASA's space program. In 2003, Hemphill and its vicinity were key search areas for debris from the space shuttle Columbia, which broke apart during re-entry on Feb. 1 of that year, destroying the orbiter and killing its crew. Members of the Hemphill community assisted NASA in accomplishing an unprecedented air, ground and water search. Their dedication was instrumental in the recovery of more than 80,000 pieces that helped NASA understand the accident, and provided the groundwork for the agency's successful return to flight, museum officials said in a statement. The space shuttle Columbia broke apart over northeastern Texas as it returned to Earth from its 16-day STS-107 science mission. 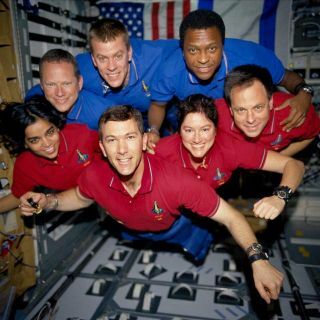 The seven Columbia astronauts killed in the disaster were commander Rick Husband; pilot William McCool; mission specialists Michael Anderson, David Brown, Kalpana Chawla and Laurel Clark, and payload specialist Ilan Ramon, Israel's first astronaut. An investigation later cited heat shield damage to the leading edge of Columbia's left wing as the cause. A piece of foam insulation from Columbia's fuel tank broke off during launch and punched a hole in the orbiter's left wing 81.9 seconds after liftoff on Jan. 16, 2003. The strike damaged the orbiter's heat shield, which then failed to protect the shuttle and its crew from the heat of re-entry into the Earth's atmosphere. During re-entry, the damage allowed super-hot plasma from the atmospheric entry to enter Columbia's left wing, destroying the vehicle as it flew over Texas, en route to the shuttle's landing site at the Kennedy Space Center in Florida. The Columbia disaster anniversary is the third of NASA's somber space anniversaries in a single week. Every year in late January and early February, NASA pauses to honor the memories of astronauts killed in the pursuit of space exploration. NASA's annual Day of Remembrance, which the space agency held on Jan. 27, is a memorial to the three astronauts killed in the Apollo 1 pad fire in 1967; the seven astronauts killed on shuttle Challenger just after its launch on Jan. 28, 1986, as well as Columbia's crew. This year also marked the 25th anniversary of the Challenger disaster. This morning, the Sabine County Columbia Memorial Committee and the J.R. Huffman Public Library hosted the eighth annual memorial for the STS-107 space shuttle mission at the First Baptist Church in Hemphill. NASA speakers at the event included Gerry Schumann, of NASA Headquarters in Washington, and Debbie Awtonomow, of Kennedy Space Center in Cape Canaveral, Fla. Schumann and Awtonomow were NASA leaders on-location in Hemphill during the Columbia recovery process. Following the memorial service, a ribbon-cutting ceremony for the new 3,400-square-foot Patricia Huffman Smith Museum, "Remember Columbia," will be held. Michael Coats, director of NASA's Johnson Space Center in Houston, is scheduled to speak at the ceremony. NASA's Columbia accident marked a turning point in the space agency's space shuttle program. NASA engineers developed techniques to ensure crew safety and the integrity of shuttle heat shields during launch. New tools were built to allow heat shield inspections in space — which are now performed twice on every mission — as well as minor repairs. In 2004, then-president George W. Bush announced that the shuttle fleet would be retired after decades of service. Seven years after that announcement, NASA has just three shuttle missions planned before retiring the shuttle fleet for good. The shuttle Discovery is slated to launch on its final spaceflight on Feb. 24 to deliver a new room, robot and supplies to the International Space Station. The shuttle Endeavour is scheduled to launch in April to deliver a billion-dollar astrophysics experiment to the space station. NASA also plans to launch one last shuttle mission on the Atlantis orbiter on June 28. That mission would deliver extra supplies and spare parts to the space station, but is awaiting final funding. NASA's space shuttle fleet has been launching missions into low-Earth orbit for nearly 30 years. Columbia was the first shuttle to fly and made its historic maiden voyage on April 12, 1981.